"Crunchy yet tender and buttery, these sparkling intertwined wedding ring-shaped cookies will become your go-to butter cookie. They actually improve in flavor on keeping. Cookies can be made up to 1 week ahead and kept in an airtight container at room temperature." Blend all-purpose flour, almond flour, confectioners' sugar, and salt together in a food processor. Add butter; pulse until mixture resembles coarse crumbs. Add egg yolk, extracts, and ice water and pulse just until a smooth dough forms. Turn dough out onto a work surface, divide in half, form into disks, and dust each disk with flour. Wrap disks in plastic wrap and refrigerate until firm and cold, at least 1 hour to overnight. Preheat oven to 325 degrees F (165 degrees C). Line 2 baking sheets with parchment paper. Roll 1 dough disk out onto a floured surface with a floured rolling pin to 1/8-inch thickness. Use a floured 1 1/2-inch round cookie cutter to cut dough into rounds. Cut out the center of each round with a 1/2-inch floured round cookie cutter to form rings. Repeat with remaining dough disk. Cut through side of 1 dough ring and slip it around another to intertwine rings, pressing cut pieces together to seal ring. 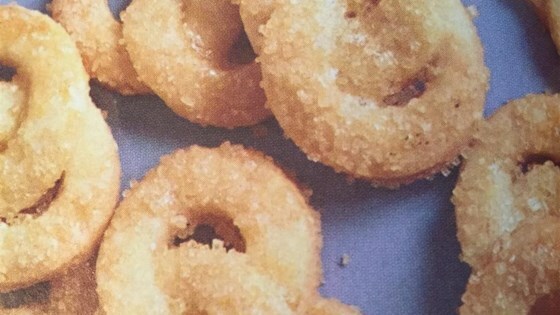 Place interlocked rings on prepared baking sheets. Beat egg white until frothy. Gently brush each "love knot" with egg white and sprinkle with turbinado sugar. Bake in the center of the preheated oven until lightly browned on edges, 15 to 18 minutes. Carefully transfer cookies to a wire rack to cool completely. I made these today, and my husband helped out as well. I like that the cookies are not too sweet.